Sri Lanka beat Hong Kong 55- 46 in the semi-finals of the Asian Netball Championships to reach the finals. Hong Kong took on the undefeated Sri Lanka in the semi-finals in Singapore on Saturday for a place in the final, with the top two teams in the tournament booking their ticket to next year’s World Cup in Liverpool. Hong Kong faced an enormous task with towering 2.08-metre goal shooter Tharjini Sivalingam standing in their way at the Asian Netball Championships. Hong Kong were no match for Sri Lanka and Sivalingam on Thursday, going down 71-48, but a historic 50-49 win over arch-rivals Singapore on Wednesday saw Hong Kong take some confidence into Saturday’s showdown. Hong Kong battled hard against Sri Lanka and stayed within reach for much of the first half, but were no match for their powerful opponents after the break. Sri Lanka remain the only undefeated team in the M1 Asian Netball Championships following their 62-59 win over Malaysia. Meanwhile Singapore will look to bounce back against causeway rivals Malaysia in the final game of the day. 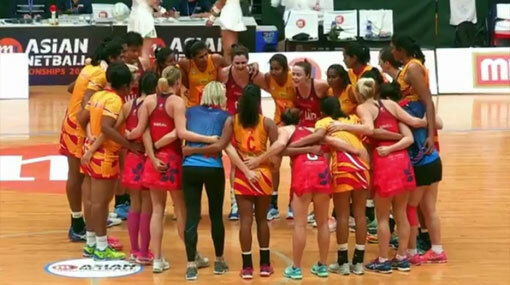 UPDATE: Sri Lanka and hosts Singapore qualified for the 2019 Netball World Cup by winning their semi-final clashes today at the Asian qualifying tournament. With two spots available at the flagship event in English city Liverpool, both last four winners knew they would be assured of a berth. The Sri Lankans kept up their fine form at the OCBC Arena, seeing off the challenge of Hong Kong. They won 55-46 to maintain their 100 per cent record at the tournament, which has been played using a double group format. Hosts Singapore proved too strong for Malaysia in their semi-final, winning 51-43. The Asian qualifiers follow Barbados and Trinidad and Tobago who booked their place in Liverpool through the Americas tournament last week. Singapore will now play tournament favourites Sri Lanka at 4pm on Sunday for the championship crown.